Check out the latest cartoon coming from the highly regarded Henry Payne. It was published in The Detroit News. Payne has been creating and publishing cartoons for over thirty years now, starting way back when he was a history major at Princeton University. Since 1999, Payne has been working for The Detroit News as the lead cartoonist, replacing Draper Hill. In addition to his cartoons, Payne is also known as a conservative columnist, his works appearing in the National Review and the Weekly Standard. 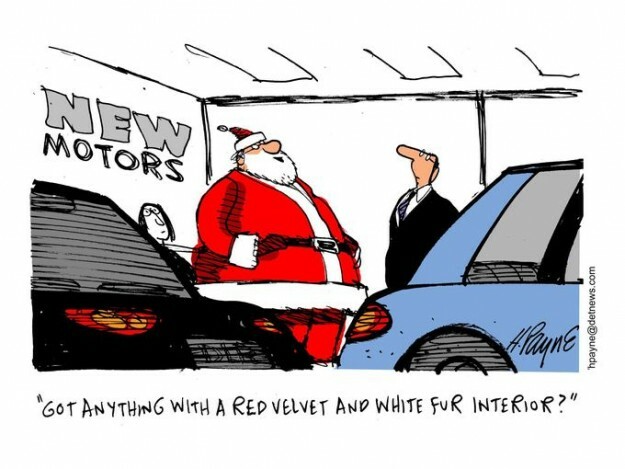 This entry was posted in Culture and tagged auto, CAR-toon, cartoon, henry payne, santa. Bookmark the permalink.